MUST BE 1.25-1.5 inch trim. I used 1.5 which I highly recommend. Tennis Racket Grip Tap (Or an old yellow rubber glove). Anything rubbery and tacky to increase friction against the fridge. This entry was posted in Draft, Drip Trays, Great Deals, Guest Posts, Projects, Reader Photos, Reader Projects, Top Post Updates on November 10, 2017 by admin. Special Thanks to Matt Del Fiacco for this special Guest Post! Find a link to Matt’s website at the end of this article. Like many new brewers, when I first started brewing I was eager to find interesting ingredients I could use, from Sriracha (bad idea) to vanilla beans (used 2 beans per gallon, terrible plan). Around this time, I tried my first bourbon-barrel stout, and feel in love with the wood characters of the beer. Wood-aged beer quickly became a passion, but the desire to experiment was still there. I noticed early on that at my local homebrew shop, all of my options were Oak of some kind, but what about Maple? What about Mesquite? This article is about toasting your own wood so you can use it in your homebrew, no matter the source or the type. Not all wood is suitable for brewing (soft-woods, chemically treated wood, etc. ), so be sure to do your research. For this article, let’s stick to commercially available smoking-wood, which is often untreated and is safe for use in cooking. In addition, this article is about chips primarily, simply because (as smoking chips) they are widely commercially available. The point of this short article isn’t to be comprehensive or absolute, but to help you get started on dialing in your wood additions so you can adjust to your system and palate. I’m happy to hear any criticisms or ideas you may have! Before we go into the different types of woods, their toasts, and the flavors that can develop, we need to understand the varying toasts of wood and how toasting temperatures develop different characteristics. This entry was posted in Guest Posts, Ingredients, Oak, Reader Projects, Third Party Updates on October 2, 2017 by admin. You often have posts about deals on Fermwrap style heaters. I’d like to alert your readers about an option that is lower cost and I believe superior to any deals I have ever seen posted. Most Fermwraps are made with Flexwatt heater tape. Another brand of heat tape is THG Heat Tape, which I have seen people post on both reptile and brewing forums as being superior to Flexwatt; I have both and find it to be more durable. Regardless, Pangea Reptile sells the 12″ tape for $3/foot. They also sell the cord and connecting clips and will install it for only $4.99 more. They offer flat-rate shipping of only $4.99, so even if you order only one 12×24 wrap, it’s only $15.98 shipped. If you order more, or make one from smaller width tape, available in 3, 4, 6, or 12″, then the savings are even more. For instance, I ordered 5′ of tape and had them make two 30″ wraps, which gives more uniform coverage around a typical fermenter. Of course, you can DIY the cord if absolute lowest cost is important. Note: This is a DIY project. Make sure you choose appropriate materials for your application. Contact manufacturer with questions. Prices are deemed accurate as of this posting, check Pangea Reptile for up to the minute price, availability and description. This entry was posted in Fermentation, Guest Posts, Projects, Reader Projects, Temp Control, Third Party Resources on May 17, 2017 by admin. This entry was posted in Adventures in Homebrewing, All Grain, Cleaning, Draft, Electric Brewing, Reader Projects, Reader Tips on December 15, 2015 by admin. Light toasts are typically toasted at a low temperature for a longer period of time. This breaks down tannins and hemicellulose, and facilitates the formation of vanillin, the chemical compound from lignin that is responsible for the vanilla flavors and aroma. Typically, smoky flavors are not present in light toasts, and wood flavors, along with vanilla, are prevalent. Medium toasts are toasted at a moderate temperature for a long period of time, which avoids harshly charring the wood and focuses primarily on the breakdown of hemicellulose, resulting in the carmelization of sugars. This toast produces toasty, sweet, caramel, and maple flavors with hints of vanilla. Heavy toasts are often the result of a two-step process. First, the wood is heated briefly at a high temperature, resulting in a strong surface toast that will impart smoky flavors. After that, there is often a medium toast for a slightly longer period of time which creates a deeper toast, penetrating the wood more fully and allowing for more complex flavors to develop. Some vanilla flavors may be present but the flavor and aroma are typically dominated by smoky, roasty, coffee like flavors balanced with notes similar to those present in a medium toast. This diagram was created by World Cooperage as a visual way of explaining heat’s effects on wood, in this case American Oak, and the characteristics that develop at various temperatures. The actual temperatures for (and presence of) particular flavors will vary depending on the levels of cellulose, hemicellulose, tannins, and lignin in the wood, so this chart won’t be across the board correct. However, the chart is a good rule of thumb and illustrates the temperature’s influence on wood well. Now that we know what characteristics can develop at certain temperatures, let’s look at the different woods and the different characters between them. Personally, I only have experience with Oak, Cherry, and Hard Maple, but this article from the September/October 2012 issue of Zymurgy contains an article noting the specific tastes of particular woods in a blonde ale, and their experiences are consistent with my own. Cherry: Dried cherry, earthy, additional sweetness in finish, light vanilla, fried bread. Phenols muted, alcohol persists, slight tannic astringency. Hickory: Light woodsy character, light hay-like aroma, slight honey-sweetness. Phenols not muted, slight tannic astringency, alcohol softened. Hard Maple: Woody aroma, maple-syrup character lingers in finish, light nutmeg. Had a thinning effect on body, alcohol subdued. Soft Maple: Caramel, yellow cake, light pear-like esters, maple sap (rather than syrup). Phenols and alcohol only lightly subdued, thinning effect on body. 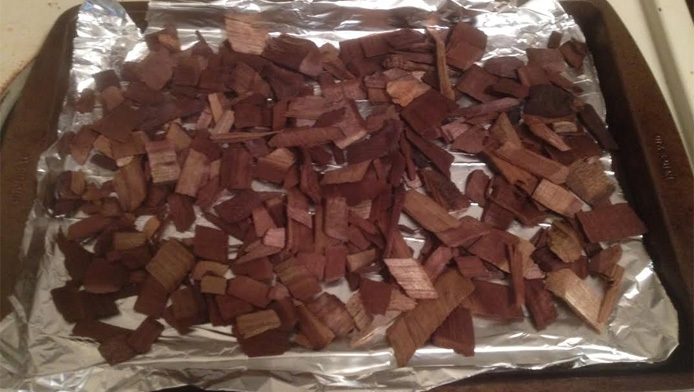 Red Oak: Red berries, woodsy, peppery, resinous. An authoritative and dominating wood. Alcohol and phenols heavily subdued slight oil contribution to mouthfeel. White Oak: Soft esters (orange, pear), chardonnay-like, light earthy and spicy (peppery). Moderate repression of alcohol and phenolics. White Ash: Light dried fruit (plum, pear), breadiness, lingering wood sweetness on finish. Alcohol and phenols subdued, considerable creaminess and smoothness contributed to base beer. Yellow Birch: Toasted marshmallow, caramel, wood aromatics strongly reminiscent of base wood varietal, aroma considerately more prominent than flavor. Not effective at subduing alcohol and phenols, moderately tannic. Using this information as a guideline, combined with the chart above, we can determine what flavors we want and estimate what temperature to toast the wood at. For example, White Ash has a lingering wood-y sweetness. In Oak, that would mean that toasting around 300° Fahrenheit would be ideal for accentuating sweetness. It’s not perfect, but it is a great place to start. Experiment, take consistent notes, and dial in the temperatures and woods you like. Last year, the blog Homebrew Dad ran a short contest to give away some yeast cultivated from the famous Heady Topper. The contest was to submit a creative recipe that you would use the yeast in, and I had the idea for a Cherry Wood IPA. I didn’t end up winning the contest, but I did have a recipe that I was really excited about, and so I set out to brew it anyways. It turned out well, but I learned quite a bit along the way, and so I’m going to take another shot at it. I put the wood on the middle rack of the oven and set my timer for an hour. Less than five minutes in, the kitchen has a great wood smell which, by the thirty minute mark, developed a characteristic I can only describe as “harsh”. Determine the type of wood and temperature you want. Pre-heat the oven to your desired temperature. Cover a cookie sheet in aluminum foil and then evenly spread your wood additions across the sheet. Put the wood in the oven on the middle rack. Set your timer for an hour, check on the wood every fifteen minutes or so. 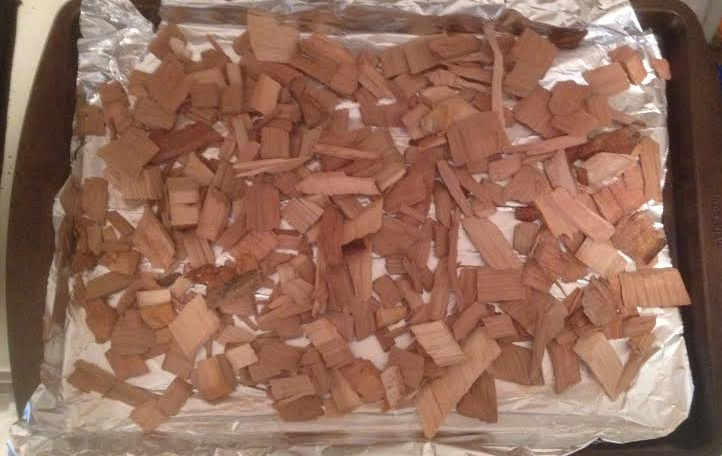 Take the wood out of the oven after an hour, toast longer if desired. Allow the wood to cool, and add it to your beer using your preferred method. How you add the wood to your homebrew is up to you. Personally, I prefer adding the wood straight to the beer after a ten minute boil. The boil will help fight off any chance of infection and will help reduce some of the tannic astringency that can come from the wood. Wood chips tend to be a bit one-dimensional in flavor contributions, and due to a high surface-area to volume ratio they impart their flavors fairly quickly. For a five gallon batch, I typically recommend about half an ounce of chips for one week. This is obviously very dependent on the beer’s style, the wood, the toast, and the flavors you’re looking for. 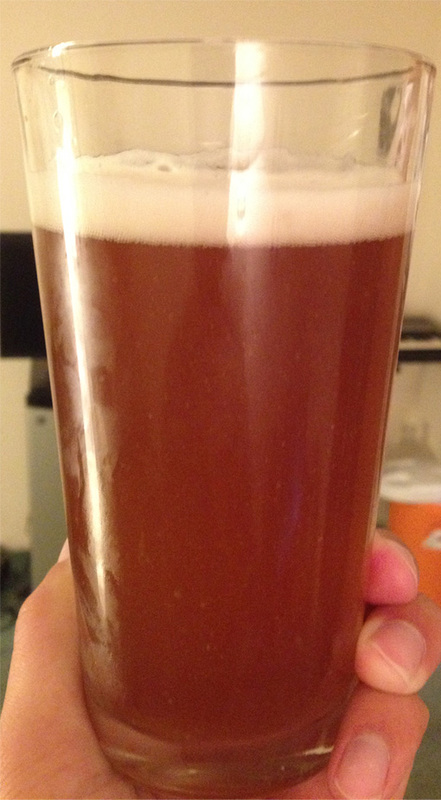 For my IPA, the half-ounce for a week was more than enough to impart a strong wood-flavor to the beer, a bit of vanilla, but none of the dried earthy characters I was hoping for. Another popular method is the use of a tincture, soaking the chips in alcohol (usually vodka or bourbon) for a few weeks to extract the flavor, and then adding that liquid at bottling, tasting as you go. This is a useful method for chips, since the flavors they impart tend to be a bit one-dimensional anyways, adding just the liquid and tasting is a good way to add a layer of flavor and aroma to your brew. If you’re looking for complexity, I would recommend using cubes and adding them as a straight addition. None of this information is beyond question, and like I said in the introduction to the article the purpose isn’t to be definitive or absolute, only to introduce you to the variety of woods that can be used and how you can treat them yourself. Experiment and dial in your methods to your palate and system. Feel free to comment here or email me with questions, comments, or criticism, and I would love to hear about your experiences using wood! Matt is a homebrewer with a passion for community, high gravities, and wood-aged beers. 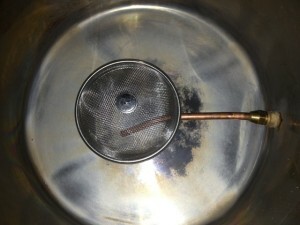 Check him and his other work out at his blog To Brew a Beer! Batcheller, David. “Wood’s Wild Side”. Zymurgy. American Homebrewing Association. October, 2012. Print. This entry was posted in Guest Posts, Ingredients, Oak, Reader Projects, Third Party Resources on March 18, 2015 by admin. Thanks to HBF Reader Scott for this tip and picture! Inkbird ITC-308 Digital Dual Stage Temp Controller with WiFi – Lightning Deal! This entry was posted in Amazon, Hops, Kettle Accessories, Kettles, Reader Photos, Reader Projects, Reader Tips on June 4, 2014 by admin. This entry was posted in Draft, Drip Trays, Guest Posts, Homebrew Hacks, Projects, Reader Photos, Reader Projects, Reviews & Top Posts, Top Posts on October 19, 2012 by admin.